Typed I diabetes (insulin-dependent diabetes) was once referred to as juvenile diabetes. This chronic condition involves the pancreas producing too little or no insulin, which is a necessary hormone required to allow glucose (sugar) into cells to produce energy for the body. Type I diabetes is different than type II diabetes when the body does not make sufficient insulin or becomes resistant to the hormone. The condition develops when the body's immune system kills beta cells in the pancreas that are used to make insulin. Some individuals acquire secondary diabetes that is much like Type I diabetes except it is not the body's immune system that destroys the cells but some injury or disease that affects the pancreas. No cure has yet been found for Type I diabetes. However, doctors can manage the condition. With the right treatment, individuals with the condition can expect to live long lives, which was not always the case. Who Is at Risk for Type I Diabetes? Dehydration – Excess glucose in the bloodstream causes excessive urination, that rids the body of much-needed hydration. Unexpected Weight Loss – because the body urinates away much-needed calories, the body cannot absorb the glucose as energy, causing the individual to lose weight. Diabetic Ketoacidosis – If the body is deprived of glucose to generate fuel, it breaks down stored fat in the cells instead. This process creates chemical ketones that require the release of sugar from the liver. However, the body still has no way of using the released sugar without insulin. This causes it to build up in the bloodstream, producing acidic ketones. The body becomes dehydrated, contains extra glucose, and a buildup of acid in the bloodstream causing ketoacidosis, which is considered a life-threatening condition if treatment is not provided right away. Cellular Damage – The high glucose levels in the bloodstream can damage nerve cells and small blood vessels that affect the heart, kidneys, and eyes. Over time, the individual can develop atherosclerosis (hardening of the arteries) which can then cause strokes and heart attacks. Only about one out of every twenty diabetic patients suffer from the diabetes Type 1 form of diabetes. Caucasians are more likely to develop the condition compared to African-Americans and other ethnicities. The condition is likely to affect both women and men equally. Although the disease usually begins before the individual reaches their twentieth year, it can develop at any age. Scientists have yet to determine what exactly causes type I diabetes. However, they believe that genetics plays a role. That said, some people develop type I diabetes from some environmental force, like a virus that instructs the body's immune system to attack the pancreas. Nearly every type I diabetic has identifiable autoantibodies along with high blood sugar. Additionally, individuals with vitiligo or Graves' disease can also develop type I diabetes. Family History – Individuals with a family history of the condition have a slightly increased potential risk of developing type I diabetes. Genetic Predisposition – Doctors can verify Type I diabetes through certain identifying genetic markers. Location – The incident rate of type I diabetes increases the farther away the individual lives from the equator. Residents of Sardinia and Finland are at greatest risk of developing the condition which is a proximally three times higher than Americans and 400 times higher than residents of Venezuela. Age – The greatest number of individuals who developed type I diabetes usually acquired the disease between their 4th and 7th year or between their 10th and 14th year. However, males and females can develop the condition at any age. Viral Exposure – Being exposed to certain viruses including mumps, Epstein-Barr, cytomegalovirus, and Coxsackie viruses increases the potential of developing type I diabetes. A1C (Glycated Hemoglobin Tests) – The doctor can evaluate average blood sugar levels of the patient over the last 2 to 3 months. The test measures the percentage of blood glucose that is still attached to hemoglobin in the bloodstream. The more elevated the blood sugar level, the more hemoglobin will attach to red blood cells. A1C levels ranging 6.5 in higher over the course of two different tests can validate diabetes. Fasting Blood Sugar Test – The doctor will ask for a blood sample that is taken after the patient has fasted overnight to determine if the blood sugar level registers less than 100 mg/dL, which is normal. Elevated numbers, especially those that are100 mg/dL and higher are considered prediabetic. At 126 mg/dL or higher, over the course of 2 different test, a confirmation of diabetes can be made. Random Blood Sugar Test – Taking a blood sample at a random time can determine if the patient has diabetes, especially if the blood sugar level measures 200 mg/dL or higher in the patient is an obvious indicator of the condition especially if the person exhibits extreme thirst and frequent urination. A positive diagnosis of diabetes can be verified by checking for autoantibodies that are known to accompany type I diabetes. In addition, the presence of ketones in the urine can verify that the diabetes is type I instead of type II. 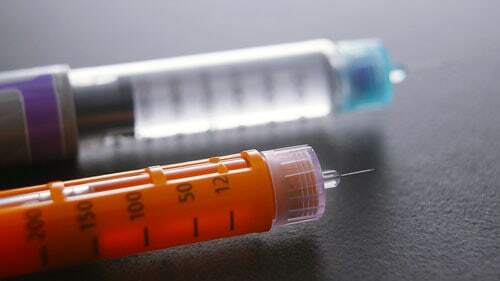 The patient can receive insulin through injections or an insulin pump that might contain a single form of insulin or mixture that helps provide treatment throughout the night and day.